I think that no matter how much bread I bake, I’ll always get a little nervous about it. You never know how much it will rise or how long it will take to rise or how it will look when you cut into the finished loaf. It makes bread baking exciting. Yes, waiting for hours for dough to rise is exciting! I said it. This is another loaf from Bread: A Baker's Book of Techniques and Recipes . It’s made with sourdough starter that’s mixed into a liquid levain the night before the dough is made. 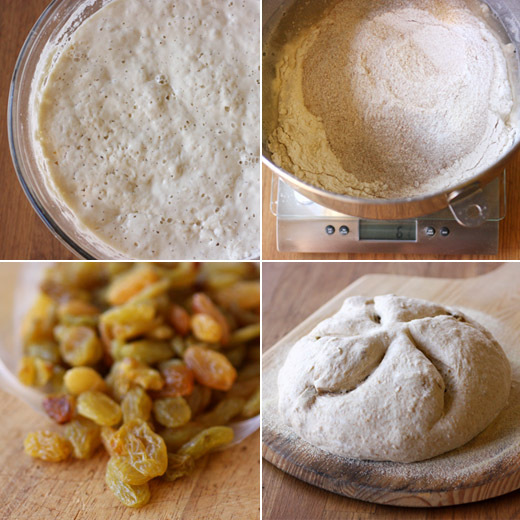 The dough is somewhat dense with whole wheat flour, oats, and golden raisins, so a scant bit of commercial yeast is used as well. The process was fairly quick with just under two hours for bulk fermentation before the loaves were shaped. With added fruit or nuts in bread, I fret the whole time it’s baking about whether or not the add-ins will be well-distributed in the end. I didn’t want to cut into a loaf and find most of the raisins clustered on one side. That added suspense as the baked loaves cooled and crackled when they came out of the oven. I told you bread baking is exciting. I always take my starter out of the refrigerator and give it a double feeding before I plan to use it. I tend to give it a small feeding once it comes to room temperature, and then a regular-size feeding about 12 hours or so before I’ll be using it. 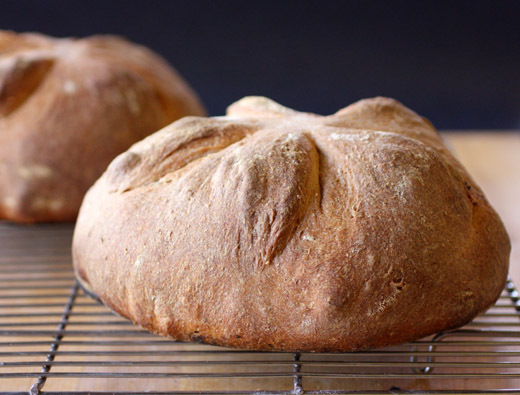 For this bread, a small amount of starter was mixed with bread flour and water to form a liquid levain 12 to 16 hours before the dough was mixed. To start the dough, oats were soaked in water for a few minutes before bread flour, whole wheat flour, water, commercial yeast, and the liquid levain were added to the bowl of the stand mixer and mixed with the dough hook. After the mixture came together, I left it to sit, covered with a towel, for about 15 minutes. Then, I added salt and a little more water and mixed for a few minutes before adding the golden raisins. I turned the dough out of the bowl, kneaded it for a few minutes and then placed it in a wide, oiled bowl which I covered with plastic. After one hour, I gave the dough a fold and turn in the bowl, and left it to ferment for about another hour. The dough was then divided into two pieces and shaped into round loaves. The loaves were covered with a towel and left to rise for an hour. I was able to fit both loaves on my baking stone, so they baked together for 45 minutes total with steam for first ten minutes. In this book, Jeffrey Hamelman writes “well-made breads never possess their finest aroma or flavor until they have cooled completely.” So, I waited. And, wondered. Finally, when I cut into a loaf I found those big, golden raisins speckled all about the bread just as they should be, and the crunchy crust gave way to a tender crumb with subtle nuttiness from the whole wheat and oats. The anxiety had ended for another delicious bread adventure. Love this - I adore golden raisins! such a beautiful loaf of bread! A wonderful bread! Very flavorful, I'm sure. Wow! Your bread looks amazing Lisa! Raisins inside give it a very nice texture. And love that you used whole wheat and oat in it. And yes, bread baking is so exciting and each time is an adventure itself! What a lovely looking loaf of bread!! Those chewy raisins must be great in there!! We like raisin bread...this would make a great sandwich for the lunch. Lisa, this bread is beautiful! Very pretty - love the golden raisins in there! I tried to make Bob's Gluten Free Bread mix in my bread machine for art class....let's just say your bread is a lot prettier than mine was. It never cooked through! 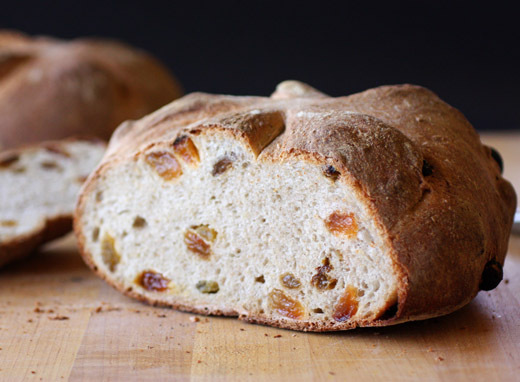 I love the look of the bread with the dried fruit in it - very good for Easter! I feel a little guilty commenting on bread during Passover :) but this bread sounds heavenly Lisa. And your photography really captures the beauty of fresh baked bread. i REALLY like golden raisins. i'm not sure what it is, but they always hit the spot. this looks like a great loaf! This loaf looks delicious and like perfection! The shape and the texture look perfect. That's an interesting comment about letting the bread cool completely. Sometimes that can be hard to do! This loaf looks delicious. Gorgeous loaf! We (well, my wife - she's the real baker!) have been baking our own bread for the last few months. So much better than what you buy at the supermarket! I really like this recipe (and we should buy that book) - thanks so much. This looks good. I look forward to trying this recipe. thanks for sharing.